Designed by the company that revolutionized mobile music production, the ProFire™ 610 FireWire audio interface transforms your Mac or PC into a powerful 6-in/10-out recording studio. Premium digital converters deliver high-definition, 24-bit/192kHz audio throughout the signal path. Two preamps with award-winning Octane™ technology offer clean, transparent sound with low noise and exceptional headroom. Onboard DSP mixing provides a totally flexible recording experience—perfect for creating multiple, independent monitor mixes. The user-assignable master volume knob gives you flexible control over output levels. MIDI I/O allows you to connect keyboards and other outboard MIDI hardware. The half-rack-space unit also doubles as a standalone two-channel microphone preamp and A/D-D/A converter. ProFire 610 is compatible with major audio software including Pro Tools*, Cubase, Logic, Sonar, Live and GarageBand, making it an unbeatable choice for personal, high-definition recording. 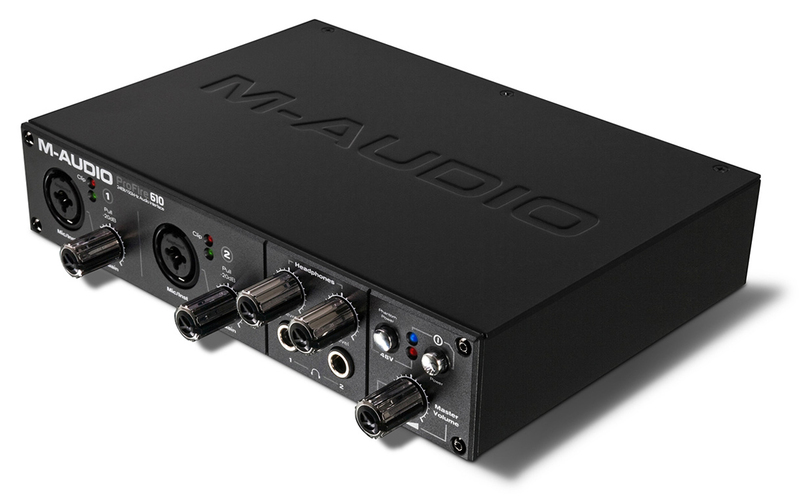 The M-Audio® FireWire 410 audio interface helped ignite the mobile music revolution by delivering power and flexibility in a travel-friendly form factor. Musicians and producers tapped into a new level of creative freedom, using the FireWire 410 to make music in the field and on the go. ProFire 610 continues this legacy by introducing new features like Octane™ preamp technology, DSP mixing and high-definition, 24-bit/192kHz audio quality. By combining these professional, studio-grade tools in a half-rack-space unit, ProFire 610 delivers the most powerful mobile recording experience. Great recordings start with great preamps. ProFire 610 brings you the same award-winning M-Audio Octane preamp technology that audio professionals trust for clean, transparent sound. Each preamp delivers low distortion and an extremely high signal-to-noise ratio—providing pristine audio fidelity right from the start of your signal path. In addition to exceptional sound, each preamp has a generous 73dB gain range**, 20dB pad and 48V phantom power. ProFire 610 features an onboard DSP mixer, giving you an extra level of flexibility and improving the overall performance of your system. Use the software control panel to create custom configurations for different recording setups, then save the settings and instantly recall them later. You can set up five unique stereo mixes sourced from any of the hardware inputs and software returns simultaneously—ideal for assigning separate monitor mixes to multiple musicians. The onboard DSP mixer also enables you to monitor while tracking, just as you would with a hardware mixer. M-Audio designed the ProFire 610 using carefully selected components, including premium A/D-D/A converters that keep your audio signal uncolored and true to any input source. We engineered the electronic circuitry to provide an optimal signal path between input and output, resulting in extremely clean recordings that capture every nuance of your performance. ProFire 610 also features critically acclaimed JetPLL jitter-elimination technology for stable synchronization and exceptionally low audio band jitter. Building on M-Audio’s time-proven FireWire driver technology—found in the best-selling FireWire 410 interface—ProFire 610 delivers solid performance and reliability at sample rates up to 24-bit/192kHz. The ProFire 610 interface delivers flexible control over output levels, allowing you to create a monitoring setup tailored to your specific needs. The master volume knob can be assigned to attenuate all output pairs simultaneously—ideal for controlling a 7.1 surround mix. Alternatively, the master volume knob can control the levels sent to your main monitors, while headphone outputs 1 and 2 operate independently. With four analog output pairs and an intuitive software control panel, ProFire 610 offers a wide range of options for unique monitoring scenarios. 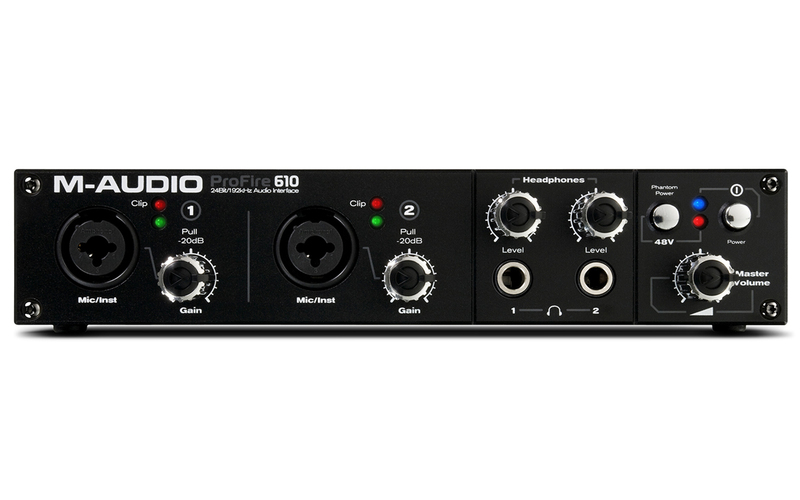 ProFire 610 also functions in standalone mode, allowing you to use its premium preamplifiers without connecting to a computer. Just power up ProFire 610, connect your microphones or instruments, and the preamp outputs automatically route to analog outputs 1 and 2, and S/PDIF. You can also connect digital devices via S/PDIF and convert to analog. This unique feature makes ProFire 610 ideal for both front-end preamplification and A/D-D/A conversion. 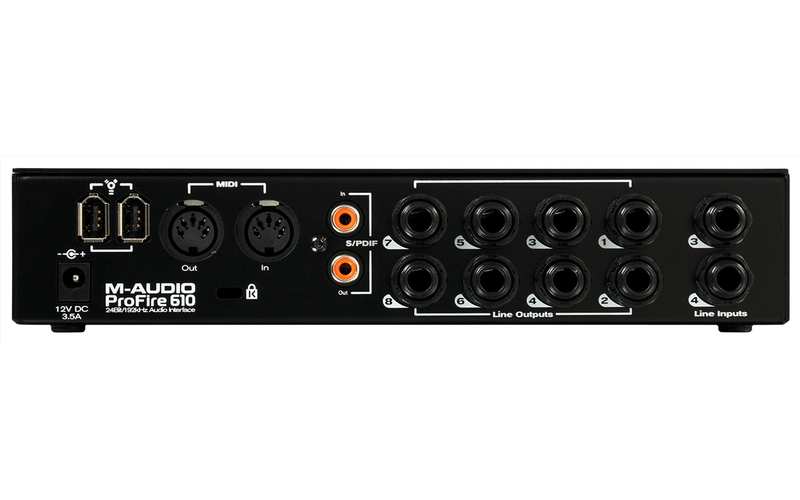 ProFire 610 features greater connectivity than any other interface in its class. Four unique analog inputs, eight analog outputs and stereo digital S/PDIF combine to form an impressive 6-in/10-out channel configuration. Easily access analog channels 1 and 2 via XLR/TS combo jacks on the front panel. Connect line-level instruments and effects processors to analog channels 3 and 4 via TRS. Use the eight 1/4" TRS balanced line outputs and digital S/PDIF to monitor and interface with outboard gear. Connect keyboards and outboard MIDI hardware to the 1 x 1 MIDI interface. The two front-panel headphone jacks are sourced separately with independent level controls for additional cue mixing flexibility. ProFire 610 allows you to enjoy full 24-bit/192kHz operation on all inputs and outputs simultaneously. Once upon a time, choosing a mobile recording interface meant sacrificing some of the features and quality found in big-budget studio equipment. Now ProFire 610 changes the game by delivering the same advanced technology and design elements found in our acclaimed ProFire 2626 recording interface. Harness the power of award-winning Octane preamp technology, DSP mixing and 24-bit/192kHz audio resolution in a bus-powered unit perfect for recording on the go. *1GB RAM required for Windows Vista. M-Audio recommends that you check your software’s minimum system requirements as they may be higher. M-Audio recommends that you check your software's minimum system requirements, as they may be higher.